Sinds de kenmerken van Amerikaanse Zilvermeeuw Larus smithsonianus in Europa beter bekend zijn geraakt (Lonergan & Mullarney 2004), werden op het Europese vasteland al verschillende mogelijke exemplaren van die soort gemeld. Vele daarvan zagen er echter niet helemaal ‘typisch’ uit en kunnen daarom beter beschouwd worden als extreme varianten van Zilvermeeuw L argentatus. In dit artikel wordt nog eens ingegaan op de belangrijkste kenmerken van typische eerstejaars Amerikaanse Zilvermeeuw en worden foto’s getoond van Zilvermeeuwen met één of meer van die kenmerken, evenals foto’s van moeilijke exemplaren die werden gemeld als mogelijke Amerikaanse Zilvermeeuw. In april 2006, two males Ashy-headed Wagtails Motacilla cinereocapilla were observed in the Netherlands. The first was at Camperduin, Noord-Holland, on 16 April and the second at Flevocentrale, Flevoland, on 22 April. Both were photographed and their flight calls were sound-recorded. Both were not aged with certainty but most probably concerned first-summers. The identification was based on the following combination of characters: 1 The rasping flight call, which excludes Yellow M flavissima, Blue-headed M flava and Grey-headed Wagtail M thunbergi. 2 The clearly demarcated pure white throat, which excludes all ‘yellow wagtail’ taxa except Egyptian Wagtail M c pygmaea (an extremely unlikely vagrant to Europe and smaller in size than Ashy-headed and the two birds in April 2006) and some (especially first-year) Grey-headed. 3 The uniformly dark head (Grey-headed would normally show a slightly darker ear patch than crown). The occasional Grey-headeds with a white throat have more dark flecking on the breast and a more diffuse border between the yellow breast and white throat. The lack of (any trace of) a pale supercilium excludes Iberian Wagtail M iberiae and makes a hybrid origin (Ashy-headed x Iberian) highly unlikely. Other hybrid types could cause confusion, especially if they (may) have a rasping call, such as a hybrid Blue-headed x Black-headed Wagtail M feldegg. These hybrids, however, would be expected to show at least a trace of a white or yellow supercilium. In conclusion, the Dutch rarities committee (CDNA) considered the documentation for both birds sufficient to accept them as Ashy-headed. These were the first two records of this taxon for the Netherlands; a previous report from May 2004 has not been accepted to species level as Ashy-headed/Iberian Wagtail. The latter bird showed a short off-white supercilium behind the eye. From 29 October to 5 November 2003, an orphean warbler Sylvia hortensis/crassirostris stayed in a business park at Middelburg, Zeeland, the Netherlands. The bird was discovered through the window of a birder’s office and identified as Western Orphean Warbler S hortensis, on the basis of the buff-coloured underparts (especially undertail-coverts; more whitish in Eastern Orphean Warbler S crassirostris), unmarked undertail-coverts without scalloping (more marked in Eastern Orphean), brownish wash on the upperparts (more silvery grey in Eastern Orphean), diffuse pale area on lower mandible (more distinctive blue-grey area in Eastern Orphean), bill shape with straight underside of lower mandible (bill longer and slightly drooping in Eastern Orphean), and large area of white on inner web of the outer tail-feather. The tail pattern on average differs between both species in the amount of white on the inner web of the outer tail-feather (often less white on inner web in Eastern Orphean); the tail pattern of the Middelburg bird fitted Western Orphean but by itself did not exclude Eastern Orphean. The bird was not conclusively sexed and/or aged; it was either an adult female (most probably) or a first-winter male. This is the first record of an orphean warbler for the Netherlands. This paper describes the first five years of Dutch Birding and the Dutch Birding Association (DBA), which were founded in 1979. It is the first part in a series that will cover the six five-year periods from the first year and volume to the current year, 2008 (volume 30). Dutch Birding was established by a small group of birders that aimed to share more information about (rare) birds and to create a platform to publish information (mainly) about the occurrence, taxonomy and identification of rare and scarce birds in the Netherlands and abroad. 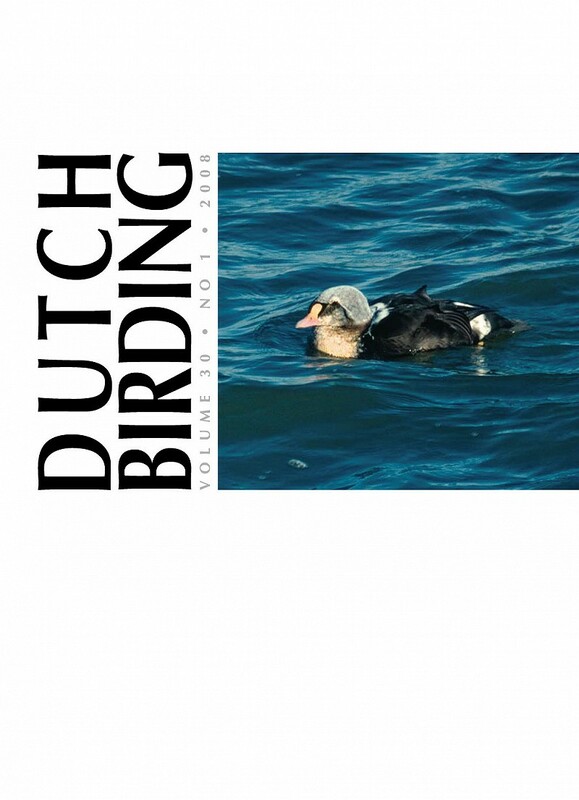 Dutch Birding started as a bilingual quarterly journal in black-and-white and was inspired by foreign examples, especially American Birding Association’s Birding. In 1979, the Dutch bird list held c 400 species. Birding became more popular and as a result, in the first five years (1979-83), 16 new species (and one subspecies) were added – including some that have not been recorded since (Harlequin Duck Histrionicus histrionicus, White-crowned Sparrow Zonotrichia leucophrys and Yellow-browed Bunting Emberiza chrysophrys) or are still extreme rarities, such as Baird’s Sandpiper Calidris bairdii (now four records), Calandra Lark Melanocorypha calandra (now three), Eastern Bonelli’s Warbler Phylloscopus orientalis (now four) and Indigo Bunting Passerina cyanea (now two). Organized Dutch Birding weeks in October to the Wadden Sea island of Terschelling, Friesland, paid off with many rare species and were the start of a tradition which still lasts – now bringing autumn crowds of birders mostly to Texel, Noord-Holland, and Vlieland, Friesland. The quality of production of Dutch Birding and of the content strongly developed in the first years and, by the end of the first five-year period, it had reached a firm position within the European birding community, with many foreign subscribers (and contributors) adding to the growth in numbers of Dutch and Belgian subscribers.